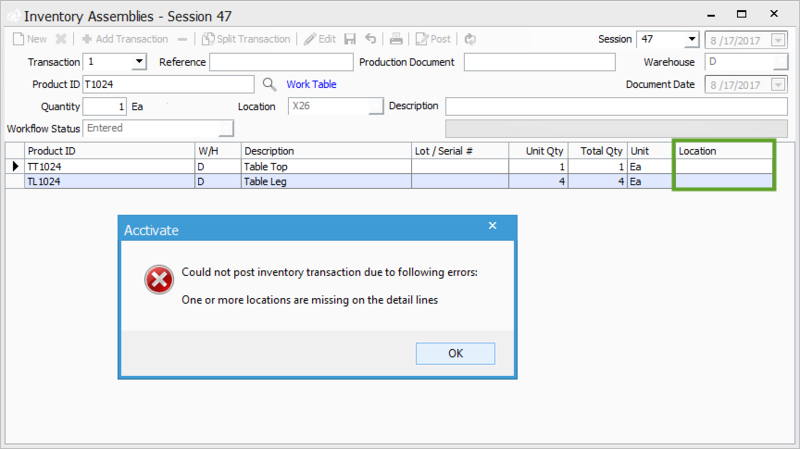 Starting in version 10.3, a configuration setting exists to require that Inventory Locations are set in order to post transactions. This is checked at the time a user attempts to post the transaction, if a Location is not set, Acctivate will alert you and prevent the transaction from posting. This article will show where this option can be enabled as well, as a few examples of how this works. Note: If enabling Multiple Location Control for the first time, this option will be enabled by default. For companies that are already using Multiple Location Control, this option will need to be manually enabled. It is highly recommended that companies already using Multiple Location Control enable this option. 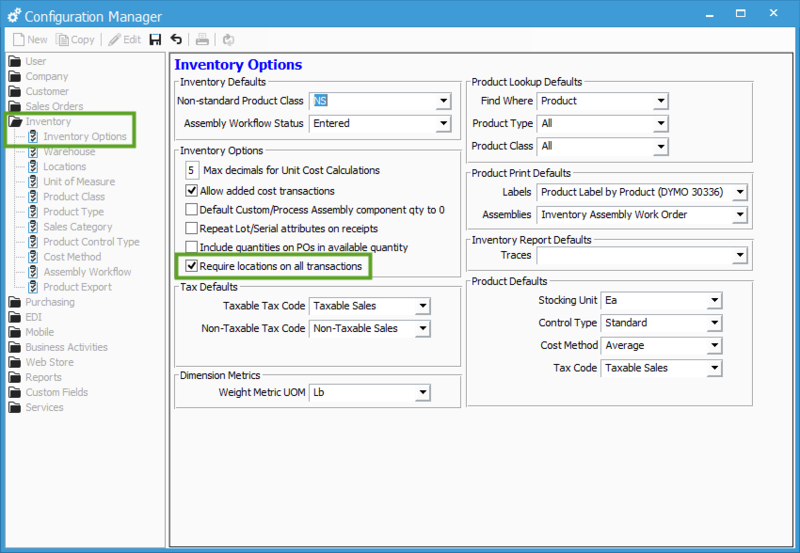 In Configuration Manager > Inventory > Inventory Options, an option exists to “Require locations on all transactions.” When this is enabled, Acctivate will verify that every line on a given transaction has a Location set. This will prevent transactions from posting with no set Location, which can cause Location quantities to be inaccurate. In the screenshot below, notice that no Location is set for line 1 on Order A1531T. 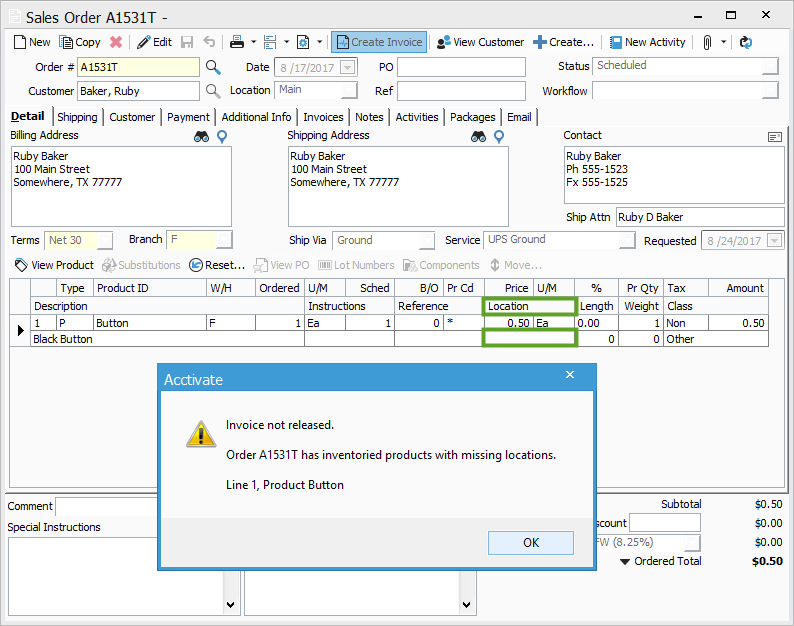 When attempting to create an Invoice from this Order, Acctivate shows a warning stating that a line on the order has no set Location. Acctivate will prevent the Invoice from being created until a Location is set for every Inventoried product (P lines) on the order. In this next screenshot, notice that neither of the Components used in this Assembly Build have a set Location. When attempting to post the Assembly, Acctivate shows a warning stating that the Location(s) aren’t set and prevents the transaction from posting. Once the Locations are set, Acctivate will allow the Assembly to post. Acctivate will prevent any transaction from posting without a set Location, except for Transfers. Acctivate WILL allow Transfers to post without a set Location. This is to allow users to move inventory from a blank location into real locations after enabling Multiple Location Control. Be careful, since Acctivate allows this functionality, it IS possible for users to post transactions which could cause Location inventory to be inaccurate. That said, this functionality would also allow users to fix incorrect inventory in Locations.